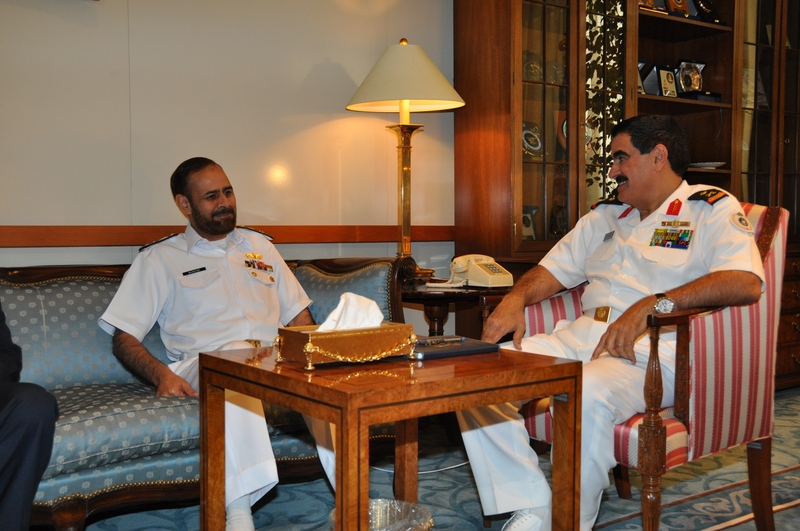 Commodore Mukhtar Khan, Commander CTF-150, visited Saudi Arabia, Jun 9-12 Jun. (L-R) Commodore Mukhtar Khan, Commander Combined Task Force 150, meets with Admiral Abdullah Sultan Al Sultan, Deputy Commander Royal Saudi Naval Forces, Riyadh. He met with Admiral Abdullah Sultan Al Sultan, Deputy Commander Royal Saudi Naval Force (RSNF), Commander Western Fleet, Chief of Staff (Intelligence), Chief of Staff (Operations), as well as the Base Commander Western Fleet, to discuss enhancing the cooperation between Combined Maritime Forces (CMF) and RSNF. Maritime issues such as narcotics, human and weapon smuggling were also discussed. Commodore Khan highlighted the importance of safeguarding areas such as the Red Sea, Bab Al Mandeb and Gulf of Aden from illegal activities including piracy and narcotics smuggling. RSNF officials expressed their confidence in CMF Maritime Security Operations and showed their willingness for continuing support to CMF in order to contribute towards achieving a stable maritime environment and safety of navigation.